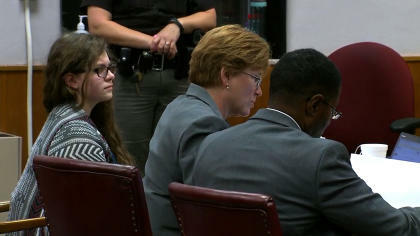 WAUKESHA, Wis. -- One of two Wisconsin girls who attempted to kill a classmate to win favor with a fictional horror character named Slender Man was sentenced Thursday to 25 years in a mental hospital, the maximum punishment possible, with credit for time served in juvenile detention. Waukesha County Circuit Judge Michael Bohren on Thursday sentenced Weier to 25 years in a psychiatric institution, retroactive to the date of the 2014 crime. Weier spoke to the court Thursday and apologized for her actions. "I want everyone involved to know I deeply regret everything that happened that day," Weier said. "I know nothing I say is going to make this right, nothing I say is going to fix what I broke." Weier said she holds herself accountable and said, "I'll do whatever I have to do to make sure this doesn't happen again." In a deal with prosecutors, Geyser, who did the stabbing, pleaded guilty to attempted first-degree intentional homicide with the agreement that she isn't criminally responsible and shouldn't go to prison. Prosecutors said Thursday they agreed that Weier should be committed to a mental health facility rather than spend time in prison, but they asked for a term of 25 years from the date of the crime, when Weier will be 37. The term "pales in comparison" to the lifetime of suffering the victim will face, said Assistant District Attorney Kevin Osborne. Weier's defense attorney Maura McMahon argued that she was very young at the time of the crime and asked the judge that she be committed until she is 25. Weier's family spoke via a video played to the court, saying doctors found that her risk of offending again is "nil." "There were times when she said, 'I don't know why I would have done this,'" her grandmother Melody Weier said in the video. "She couldn't figure it out, and that would bother her a lot." Weier's father spoke in the video and asked for forgiveness from the Leutner family. Bohren read from the victim's mother's statement in court and said it outlined the devastating impact of the crime, which created "longstanding, deep wounds I doubt will ever heal." Bohren said Weier appears to be mature in court and is remorseful for her actions, but said he took into account that the crime was planned and that the intent was to kill the victim. He also noted that doctors have reported as recently as July that she still shows some of the delusional characteristics that factored into the crime, including that she believed an "evil spirit" had escaped a homemade ouija board she was playing with and was "pushing down on her bed." Bohren said he factored in the safety of the community into his sentence and said it appears Weier still has mental health issues. "As much as we can say 'I will never do it again' – and I think it's sincere – we don't know," Bohren said.